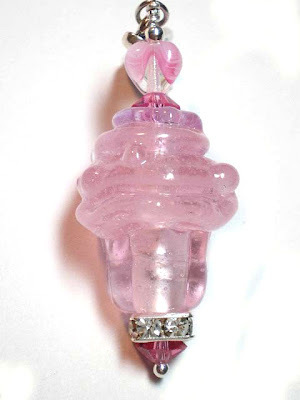 I am fascinated by this pink glass! It shimmers like ice without containing any glitter. Amazing work by glass artisan Payton Jett. 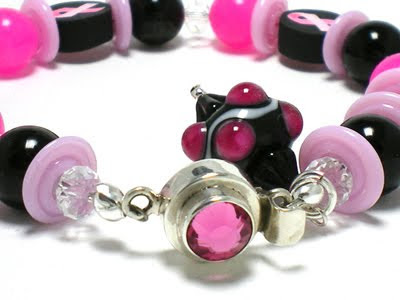 This is the latest in my breast cancer awareness jewelry where 15% of the purchase price will be donated in your name or a loved one's name to the cancer research organization of your choice. Whether or not you purchase it for this reason or simply because you love it, it's such a beautiful example of one of a kind glass jewelry. The awesome ribbon you see here is really a super thin brass, copper or aluminum wire and then coated with an enamel covering to add its beautiful softly glowing color. The surprise is that it provides an incredibly soft feel, just like ribbon, but when pulled or twisted the wire creates a lace quality. It is also nickel free and waterproof. The wonderful thing about Italian Mesh Ribbon is that it can be ruffled, straightened, twisted, and even shaped into flowers. I have given myself a new directive: put meaning into my jewelry. Sales in so many markets are down which caused me to think about what I was really providing in my work and all I came up with was fun and luxury. Which is fine and mainly what jewelry is all about. Well, a lot of people are cutting back on those two items so I had to dig deeper to find what I could do with my jewelry that would actually touch the hearts of shoppers in this particular area so that they didn't feel they were spending foolishly. 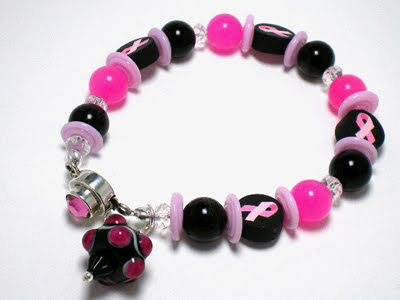 I recently designed a bracelet for a favorite cupcake bead artist friend who came through cancer and it hit me that I could do this for so many others as well. My mother died of pancreatic cancer in 2002 and although I didn't have the disease myself, I see my experience as its own kind of survival. Whether we have the disease, aid those who do or want to provide a tactile object to those to represent our love & support, jewelry can be a very sentimental and powerful tool. 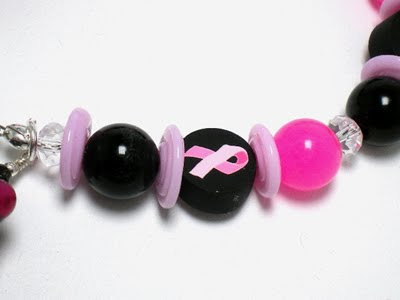 So my goal is to work with my friend, Bonnie, from Kennick Kreations who designs these beautiful polymer clay ribbon beads in various colors that show awareness for various types of cancer. My greatest interest is to design pieces that are custom to each individual and their experience. 15% of all these purchases will be made in the buyer's name to an appropriate research organization. This bracelet is currently available in my Etsy shop. I am hooked on Facebook's game of Farm Town. I need to decide whether it's an addiction or an obsession. According to the dictionary, an addiction is "the state of being enslaved to something that is habit forming to such an extent that its cessation causes severe trauma". 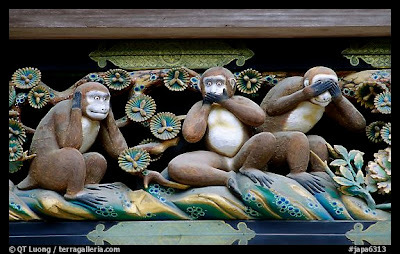 Obsession is "the dominance of one's thoughts or feelings by a persistent idea or image or desire. Okay, so I feel almost enslaved by the dominance of my thoughts towards a desire to play farm town (as often as possible)....but if I didn't have it I would NOT be severely traumatized (as evidenced by my lack of computer access for 5 days during vacation). Oh, lordy, I'm a mix of both! All I know is, I love playing this game, advancing to the next level, becoming a "millionaire" and, well, the avatars are just so cute! I've never been one drawn to video games with the high level of detail to which you have to pay attention....it's always seemed overwhelming. But farm town is just right for me....perfectly oriented for the type "A" personality that just wants a world where they are in comPLETE control...even if it is a little virtual online world....and THAT's where I get my satisfaction. Anyone ticks me off? I just delete the connection to them and they can't ever return. Anyone I hire to harvest my little crops sasses me? They are out! Not that these happens much, but just knowing I can send them into my form of oblivion is really quite satisfying....I say that with a wry grin on my face! And the few close farmer friends I've made make me laugh, save crops for me to harvest so I can advance more quickly and just make our little virtual world that much more enjoyable. If you want to see what you think, www.FarmTown.com will get you there. Maybe I can get YOU hooked!